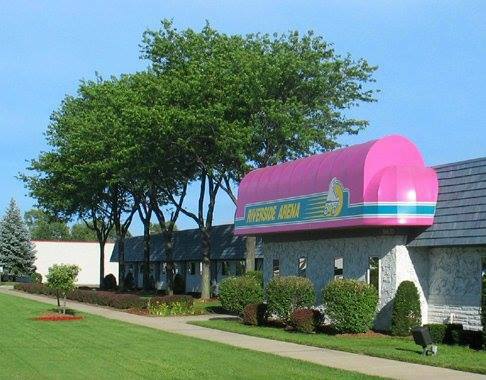 One of the best roller skating rinks in Livonia, MI, Riverside Arena Roller Skating Rink is a 1 floor indoor roller skating rink is open year round. It was founded in 1984. Roller skating sessions for All Ages are one of the main attractions at Riverside Arena. Skating provides great exercise and an opportunity to get out of the house – plus, it is not like exercising at the gym… skating is fun! Lace-em up and come join the others. Get on the floor and get ready for a great experience. If you do not see the rinks public roller skating schedule posted, be sure to contact them at (734) 421-3540 for their public session times. If so, the folks here love to teach and their instructors are top notch. For beginners they usually focus on providing the basics. For more advanced skaters they focus on proper form, technique and getting you ready to meet your goals. Call Riverside Arena at (734) 421-3540 for more details. Why not have your party or event at Riverside Arena? They can make their rink and other facilities available to you for birthday parties, holiday parties or corporate events. Their prices are great. They would love to have you out. Give them a call if you would like to schedule your event now at (734) 421-3540. Please call at least one week in advance to properly schedule your event. Got the munchies? Riverside Arena provides food and beverages in the snack bar. I hosted my son’s 8th birthday party here on Jan. 23rd, 2016, after visiting a dozen times before. I will admit the music is family driven and never had any conflict prior to this incident. Upon booking the party I was told to be fifteen minutes before my party to check-in and be seated. I did just that. When I arrived the hosted was not ready and a previous session was still in progress. I was told to wait for the hosted to come out and speak with us. The hosted came to me at about 2:10 pm, ten minutes into my party. She explained the rules, at that time I asked if my child’s ice cream could be put away. Here’s were things got ugly. I was told they did not allow ice cream. I asked if the guy/manager was sure because I didn’t recall being told that. At that time I was rudely interrupted by whom I found-out later was the owner, that “I could leave if I didn’t like it!” Mind you my son is standing there listening to this. The same “owner” then took my goodies bags and said we are not allowed to have them until the end of the party. Again, something I did not recall. He then began to become verbally abusive, and aggressive yelling he had “Medicare and did not/need want my business”. In an effort not to ruin my son’s day, I attempted to have a conversation to calm the situation in which his daughter tried to explain what I was saying and pleading him to stop being so rude without justification, as I was calm and confused. I absolutely would never come to Riverside Arena in Livonia, MI again! Did I mention I had over 18 children at my event at $13.00 per child and this was the thanks I received. Do not patronize this family owned business as you are NOT appreciated and treated like trash.